LACMA and the Petersen Automotive Museum offer on-site dining facilities, and within easy walking distance there are more restaurants, fast-food options, and even a collection of L.A.'s famous lunch trucks. So whether you're hankering for a quick and crispy taco, or savoring a lengthy gourmet meal, you'll find something to satisfy your taste buds. In addition to Ray's and Stark Bar, LACMA offers two places to eat with tables and chairs. Both are located in or adjacent to the Times Mirror Central Court (near the upper-level ticket booths). 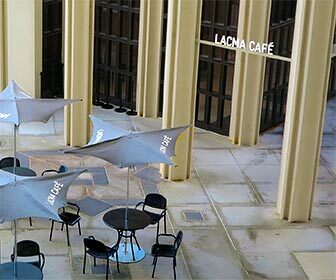 LACMA Cafe is a cafeteria-style indoor restaurant (with some tables outside). C+M (Coffee and Milk) is a coffehouse that offers coffee, cappuccino and espresso as well as organic milk sorbet, cookies and sandwiches. Outdoor tables with chairs are available nearby. Ray's restaurant serves Mediterranean food at indoor dining tables and outdoor patio seating. Stark Bar is directly adjacent and offers specialty drinks at the bar or in the outdoor patio. The two share a combined facility that is located in the back of the BP Grand Entrance plaza (behind the Urban Light lamppost exhibit and the ticket booth). There are kiosks near the BP Grand Entrance plaza (same level as Ray's and Stark Bar) that sell snacks from C+M as well as lunch meals such as BBQ ribs. 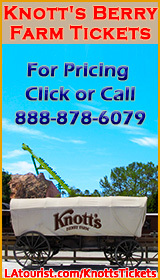 The kiosks are seasonal and subject to availability. There are some vending machines that offer snacks, candy, gum, sodas, and bottled water near the restrooms and picnic tables outside of Page Museum. About a dozen lunch trucks line up on Wilshire Boulevard, across the street from LACMA, and between the Petersen and the Craft and Folk Art Museum. Offerings include gourmet meals, ethnic varieties and other specialty foods... as well as typical lunch truck fare such as burritos and sandwiches. Museum Square is a nearby office building; not a collection of museums. However the adjacent restaurants are walking distance from the museums, across the street (Curson Ave) from La Brea Tar Pits. CAFAM is a short walk away, on the other side of Wilshire Boulevard. Museum Square a great place for lunch or a snack after exploring the attractions, or during the transition from one museum to the next. Hamburger restaurant that offers a menu of signature burgers, or you can custom build your own. We're talking about thick, juicy burgers piled high with condiments, or just plain if you like it that way. Marie Callendar's upscale restaurant offers an expanded menu and a full bar with wines and specialty drinks. The restaurant features tables and large booths with plush seats, live piano music and a warm ambience. They call this a pizza restaurant but it also offers a full menu of pasta, calzones and sandwiches. If you're in the mood for Italian food then Johnnie's will not let you down. The restaurant is smaller than Callendar's Grill and it's in the same price range, but the service is great and so is the food. Mexican dishes at a fast-food grill that offers meat and poultry dishes made from fresh ingredients and includes a beverage bar and salsa bar. The tables are a bit on the small side and the ambience is not as cozy as the other restaurants. But if you're looking for something quick and inexpensive then this is a great choice. This is a Starbucks where you can buy Starbucks coffee, drinks and treats. Opens at 6:00 AM. Salads, grains and other vegetarian, environmentally responsible fine food using organic, local & seasonal ingredients. Open Monday through Friday for lunch only. Drago Ristorante is located in the front lobby area of the Petersen Automotive Museum. You do not need a ticket for the museum in order to visit the restaurant. In fact, you can enjoy a handful of displays in the lobby, including cars, motorcycles and memorabilia. You can also peek inside the large glass windows and see automobiles on display inside the museum. The gift shop is nearby, and can also be visited without admission to the museum. Here are some alternative options to follow up your museum visit with an evening of fun, food and entertainment. Irish restaurant and pub, featuring a full menu for diners as well as a full bar. Open for lunch and dinner every day. 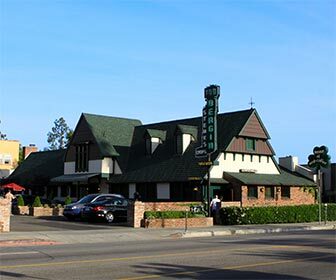 The restaurant is located on Fairfax Avenue, about a 5-10 minute walk south from Petersen's Auto museum. Parking is available. An Irish pub that features live (and loud) music almost every night (admission is charged for shows). The establishment is open for lunch every day from 11AM to 2 PM. It is located on Fairfax Avenue at 6th Street, essentially "behind" the LACMA campus and about a 5-minute walk. There is metered parking on Fairfax Avenue and on Sixth Street, but it is often full. 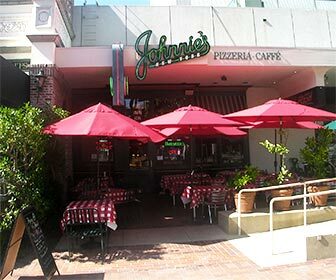 When the Petersen closed for renovation in late 2014, Johnny Rockets moved to the Beverly Connection shopping mall on La Cienega Blvd, which is about a mile and a half from the Miracle Mile. IHOP serves breakfast, lunch and dinner 24 hours a day. Fresh sandwiches hand made to your specification. Choices include various meats, seafood and vegetarian selections. Open for lunch and dinner, serving sushi, sashimi, tempura and other Japanese dishes. Mexican fast food using fresh ingredients, with indoor tables and seating. Fast-food counter restaurant with indoor tables and seating, serves BBQ chicken and beef plates, with rice and more. Fast-food counter restaurant with indoor tables and seating, serves hamburgers, hot dogs, sandwiches, fries and drinks. Mexican food restaurant that is adjacent to the El Rey Theatre. The restaurant uses fresh ingredients, local organic produce and free range poultry. Open every day for lunch and dinner. A small Japanese restaurant serving authentic cuisine, located at the back of the building (behind the UPS Store), away from the noise on Wilshire Boulevard during rush hour traffic. Here are some nearby tourist attractions that are close enough for a quick drive or bus ride. Little Ethiopia is located about a half mile south from the Petersen auto museum, and offers about a half dozen Ethiopian restaurants, as well as some shops selling antique furniture, vintage clothing, custom jewelry and hand-made items. 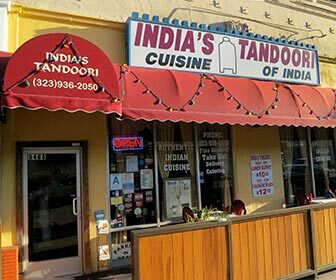 The original Restaurant Row in Beverly Hills on La Cenega Boulevard is located about a mile west from the Miracle Mile, and there you will find a collection of some of L.A.'s finest cuisine. Restaurants, cafes, snack shops and specialty shops located at The Grove, which is adjacent to Original Farmers Market, less than a mile from LACMA. Farmers Market offers an adjacent Dupar's restaurant and prepared meals inside the market, as well as local fresh fruits, vegetables, poultry, meats, candy and other treats. Farmers Market is located a little over a half mile from The Petersen and LACMA. Third Street between Farmers Market and the Beverly Center offers an array of restaurants, shops and other dining options. The area is located about a mile from the museums.